Lamiderm APEX Skin Serum for the face works out your skin’s imperfection on cellular level. It contains FGF that has the ability to regenerate skin cells with no chemical side effects. 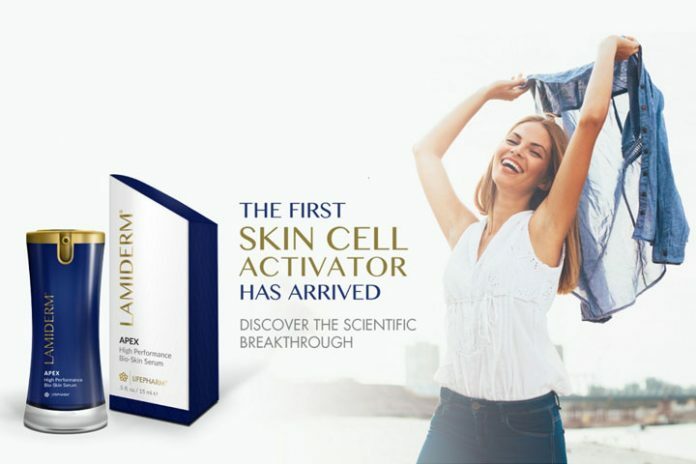 Lamiderm is unique because it’s the only skin health product that contains Fertilized Avian Egg Extract with LOX Enzyme Activator. It restores skin’s natural elasticity, gives true firmness and healthy glow. Lamiderm also actively brightens and lightens skin while repairing skin from UV damage. Lifepharm proprietary egg extract formula is the only known source of Active LOX (Lysyl Oxidase) that can be applied directly to the skin. There is no other skin care product with a naturally-occurring LOX Enzyme activator. The LOX enzyme is plentiful in a youthful skin and helps to ink small collagen fibers to longer, stronger fibers. There is no other skin care product with a naturally-occurring LOX Enzyme activator. This technology is possible with the use of the natural FGF made from avian eggs. This breakthrough is celebrated by the success of Laminine’s anti-aging benefit that is known to delay signs of aging by reducing stress, rejuvenating and repairing cells, and boosting stem cell activities in the body. Laminine food supplement is known to affect skin health by encouraging existing stem cells in the body to boost skin repair. By combining Lamiderm Apex Skin Serum and taking Laminine supplement, your true beauty is being restored from the inside and out. Frequently asked questions on Lamiderm Skin Care Serum. Updated Lamiderm price list for 2017. Where to buy Laminine in the Philippines? Althea Distributor is an authorized distributor of Laminine products. We take pride in making sure your order is followed through, tracked, and delivered in perfect condition. 100% Customer satisfaction guarantee.